PVCFS, bubble baths, and a Higher Love. | details in the fabric..
Beautiful lyrics from a truly beautiful song. I recently discovered it through a TV ad. Take a listen to James Vincent Mcmorrow’s cover of Higher Love. His voice is wonderfully haunting, and will give you tingles for sure. Perfection. 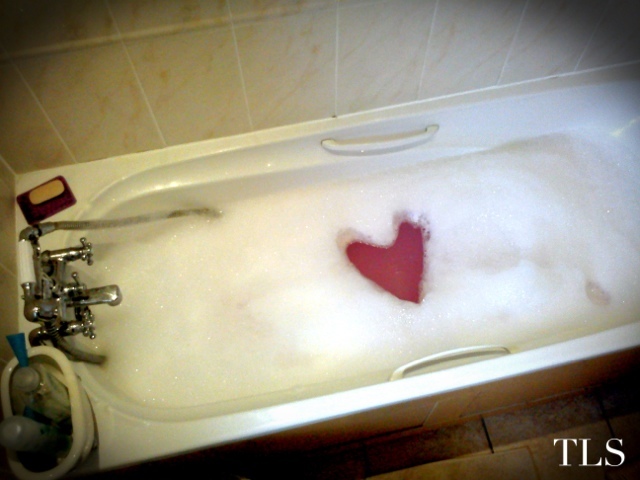 Even if that Higher Love is me standing on the loo seat in my bathroom, just to photograph a heart of pink water from a bath filled with bubbles. I’m a water baby; I was born in water, at home in a special birthing pool. My parents were even going to call me Delphina (dolphin), but Dad didn’t like it much. I’ve always been a pretty good swimmer though, right from the word go, haha. That feeling of being immersed in clean, clear water.. I always feel so free. I’ve recently been diagnosed with Post Viral Chronic Fatigue Syndrome. I had glandular fever, and it’s kindly left me with an overwhelming tiredness. This is the kind of tiredness that hangs over you like a huge shadow, and consumes you. The kind of tiredness that you didn’t realise existed until you experienced it. It’s not like ‘yawn-I’m-so-sleepy’ tired, or ‘phew-that-was-hard-work’ tired, but it’s always there. Every night I go to bed with it, and every morning I wake up with it, completely unrefreshed.. I really don’t like talking about being ill, which is why I haven’t mentioned it yet, and I don’t really intend to dwell much on it in future posts either. People are worse off than me, and I guess I’ve just got my cross to bear for a bit, until I get better. (Approx 3 to 6 months I’ve been told..) But it is relevant, I promise. Another huge part of PVCFS is that I have constant aching muscles. Like the tiredness, it gets better and worse, but it never goes away. But.. wait for it.. I have found a cure! A cure for the aching muscles! Well, a temporary one at least. And the cure, ladies and gentlemen, is a good soak in the tub. Yay! And demonstrate the effectiveness of the cure, I will give you the example of Thursday evening. On Thursday evening, I was so relieved and relaxed in the bath that I stayed in it for two-and-a-half hours.. Just soaking, and occasionally topping up with a splash of hot water. I think that’s a record, even by my standards. Previous At the top of La Tour I-Fell.. Next Cats have no appreciation for good music. Hi there, just was aware of your weblog via Google, and found that it is really informative. I am gonna watch out for brussels. I will be grateful if you continue this in future. Numerous other people can be benefited from your writing. Cheers!